This was a strange book to find at the Singapore (central) library; it is a title from Xlibris, a self-publishing company, and the book’s editing quality reads like it. Children of the Violet Ray has interesting and potentially important content, but oddly organised chapters, and some awkward and vague prose. (Disclaimer: I am a Virgo.) But I still recommend it as a read for parents and those who suspect themselves a little different. The author, Dianne M. Goodman-Larson is a clairvoyant and Melchizedek priest. (Drunvalo Melchizedek also appears in the book for an interview.) 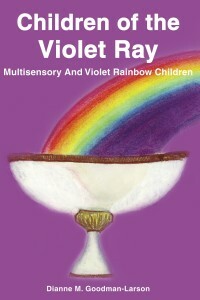 The first part of the book describes the children of the Violet Ray–they include the Indigos and the subsequent waves of children with more multi-sensory gifts and psychic abilities. After the introductory chapters (of which “My Little Angel” was particularly convoluted), there are four chapters on individual cases. It’s only after this point the book delves into its most thought-provoking and actionable content. There are many who think of Indigos, Crystals and Rainbow Children as merely fashionable labels, but it does take a clairvoyant to confirm these colours in the aura. Dianne doesn’t waste time on the laundry list of Indigo traits — she covers thoughts, matter, energy and the interactions of these that affect Indigo and Violet Children. These interactions of energy (good and bad) may not be seen or understood by most people, even if the effects (learning and behavioral disorders, depression, bullying, child violence) are tangible and common. And even if the skeptical materialist is going to dismiss the energetic origins of these phenomena, it behooves those who are open or sensitive to start empowering themselves against the outward negative energies running rampant. We live in an age rife with hate, trauma, media programming, victim and control mentalities, and frequencies and substances that scrabble the mind. There is much keeping us from our full potential. There is clearly a lot work to do, and the Violet Ray Children face a fierce battle. It is no accident that this world, on its unsustainable path of inequality, lack and pollution, now has these waves of beings incarnating at this time, to bring change. But there are also forces resisting that have long benefit from the suffering and control. It is interesting to note how the early, strongest and most beloved advocates of peace and change that we’ve seen in our own time (John Lennon, Gandhi, JFK) met violent ends. This is the magnitude and scale of the resistance that we can see. Dianne includes holistic health practices, rituals, prayers, dietary and therapy recommendations for the children of the Violet Ray, who are destined us to teach us how to create and be a better world. What she sees with her clairvoyance gives us additional tools with which to do this. We can only empower ourselves with the information.